This model is discontinued. As an alternative, we recommend the DeLonghi EO1238 Toaster Oven. 6-SLICE (0.5 CUB. FT.) TOAST CAPACITY - Now you can make enough toast for the whole family û all at the same time. LARGE CAVITY ACCOMMODATES 12" PIZZA - Make pizza for the whole family. COOL-TOUCH SIDES makes it safe to the touch. 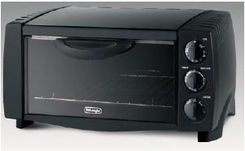 BAKE, BROIL, TOAST, SLOW COOK OR KEEP FOODS WARM - This is the ideal multi-function family oven. Multiple cooking settings with adjustable temperature control let you prepare food simply and conveniently. ACCESSORIES INCLUDED - Aluminum bake pan, aluminum broil tray and 1 invertible rack. SLIDE-OUT CRUMB TRAY - Easy removal makes cleanup quick and effortless. TOAST COLOR SELECTOR WITH AUTOMATIC SHUT-OFF - Toast color selector and end-of-cycle signal with auto shut-off assure perfectly prepared toast every time. Capacity: 6 Slice / 0.5 cub. ft.